The apartment is located within walking distance of Vilamoura Marina with all its restaurants and shops and within walking distance of the beautiful Falesia beach. There are several golf courses, Millenium, Victoria, Pinhal, The Old Course, Laguna are all a short taxi ride away. There are 2 waterparks, including Zoomarine, and for those of you who enjoy shopping Algarve shopping centre is 20 minutes as is Faro shopping centre.Almancil, Vale de Lobo, Albuferia and Faro are 15-20 min drive. Bedroom 1 - Spacious bedroom with a large double bed and a single bed, with bedside tables and lamps, ensuite bathroom. double doors leading to terrace, Tastefully furnished, dressing console with mirror, seat and hairdryer. Bedroom 2 - spacious bedroom with fitted wardrobes and safety deposit box. Twin Beds with bedside tables and lamp. Console with mirror and seat and a second hairdryer,TV with integral DVD wall mounted. Large wardrobe space with drawers in entrance hall. a visit to a local bakery is a must. 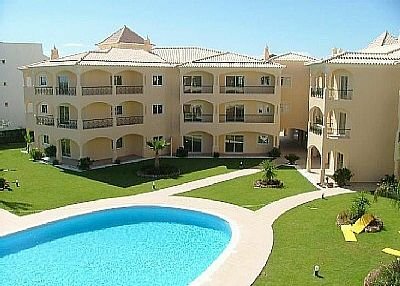 This apartment has lots of extras which make a huge difference to the enjoyment of your holiday. The children and adults can enjoy a selection of dvds and Playstation 2 with games. There are Ipod speakers to provide music during your stay. Breakfast tastes better with fresh juice and coffee , and there is a coffee maker and juicer in this apartment.